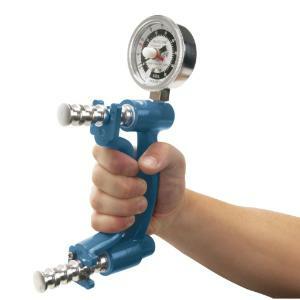 The 200 pound standard head Baseline hand dynamometer has become a popular tool used by therapists all across the world. The standard 2 1/2” diameter head is used throughout the industry. This Baseline Hydraulic Hand Dynamometer gives accurate grip strength readings without the subject being able to "feel" the handle move.The hand dynamometer's handle is adjustable with five positions to accommodate any hand size. Indicator remains at maximum reading until reset.